Linear A is the first of two linear scripts which were used on Minoan Crete. While Linear A was discovered along with Linear B by Arthur Evans, it has yet to be deciphered. It can be somewhat understood, though, through comparisons with Linear B. 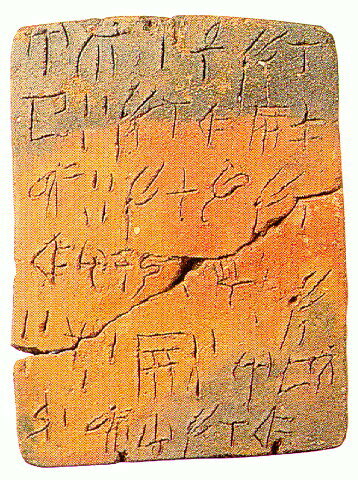 Linear A was used during the New Palace Period on Crete and has been found mostly on clay tablets. Chronologically Linear A originated before Linear B, however both scripts along with the Cretan hieroglyphic script are thought to have been used alongside one another for a long period of time in certain areas. Linear A contains 75 symbols each representing a syllable as well as some ideograms, representing a word or idea. The script shares eighteen symbols with Linear B however it represents a truly Minoan set of words which show little connection to the Greek language developed later on the mainland. There are many sites where Linear A inscriptions have been found, including Knossos, Mycenae, Tiryns and Chania.